If you've been following along, then you know that 2015 was always going to be a BIG year for the Huff household. Not only will I be editing my book this year (Spring 2016 release) and working on my various freelance gigs, we also welcomed a new baby boy into the world. A little bit late, Everett James decided to join us last weekend. Nearly 8lbs of perfection. He has tons of dark hair, his daddy's nose, and the sweetest personality. So far, our favourite new activities include lots of pj's, snuggle sessions, and making faces at each other in the moments that he is actually awake. I won't get into too many details here, but you can follow along for more pics and such over on Instagram. One baby thing I will be introducing to the blog this year is the series "Baking with Baby." Since this is all new to me, I will be talking about the meals and treats I make while caring for a newborn. I already did some food prep before baby got here that I will share, as well as the energizing breakfasts, hearty lunches, and fresh snacks/dinners I will need to get through the upcoming year as a new mom. Or at least that is the idea. I welcome you all to follow along to see what works and what doesn't. Hopefully you will be able to learn a thing or two about balance and nourishment. Also, feel free to share any tips on how you survived the months of nighttime feedings, a sleepy yet demanding little one, and/or trying to go back to regular life while cooking/cleaning with one hand when the other is holding a swaddled baby. Before baby arrived, I made the Wholegrain Chocolate Muffin mix from Izy Hossack's Top with Cinnamon cookbook. This make-ahead mix is simple to throw together, and even easier to turn into a small batch of muffins when the mood strikes. Just make the dry mix and store. When ready to use, just mix in the second half of the ingredients - they will be ready to bake before your oven even finishes pre-heating. Within the first few days of baby being home, I already made a batch. 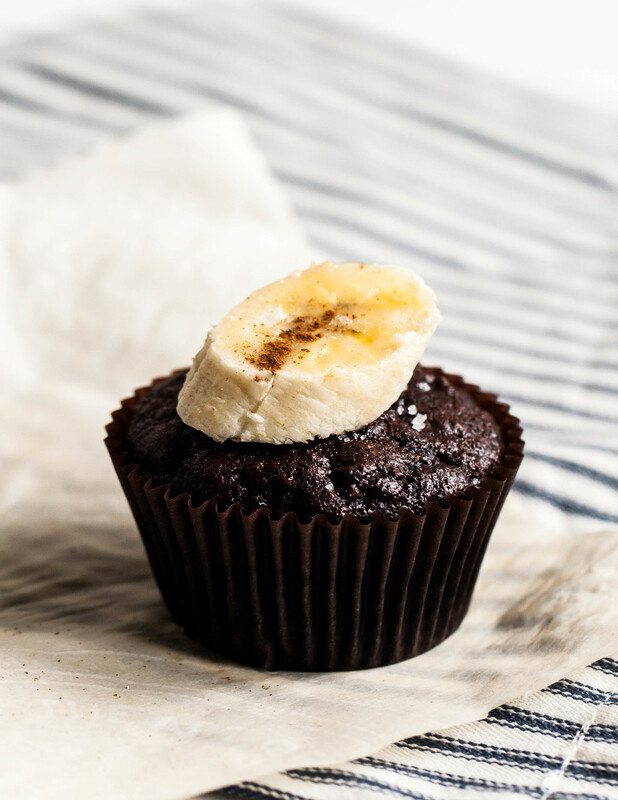 I gave Izy's recipe a twist to create Wholegrain Banana Chocolate Muffins with fleur de sel, cinnamon, and cocoa nibs. We had some bananas that were over-ripe when we got home from our hospital stay, so they made for the perfect addition to her recipe. My sleep-deprived husband and I gobbled them up both as a late-night snack and for breakfast to fuel us the following day (they stay super moist if wrapped up overnight). So whether you have a new baby at home, busy family-life, or just want a quick, sweet yet healthy snack to get you through the day, make this mix! You'll thank me and Izy later. Sift together the dry ingredients. Stir until combined. Add in the oil and rub it into the dry ingredients until evenly distributed. Store in an air-tight container until use. When ready to bake, pre-heat oven to 350 degrees. Mash banana in a medium mixing bowl. Stir in the egg, milk, and vanilla. Stir in 1 3/4 cups of the dry mix until combined. Divide between 6-8 lined muffin cups. Sprinkle with cocoa nibs and flour de sel. Bake 20-25 minutes or until done. Top with banana slices and cinnamon, if desired. It's here! It's finally here! It is BERRY SEASON!! I am so excited. So many beautiful, organic red berries have been flooding the grocery store this past week. Even just before I started typing, I ate a whole bowl of sliced strawberries. Some recipes that I post here are well thought out and planned in advanced. Some recipes are more spontaneous. This is the latter. I was whipping up an old cream cheese cake batter and decided to make these little tea cakes. I had just picked up a few cartons of raspberries and knew immediately that I wanted to incorporate them into a dessert ASAP. Thus, these chocolate chunk - cream cheese Raspberry Tea Cakes. Like I mentioned, this is based off an old favorite cake recipe of mine. I used to offer it for weddings when I ran The Frosted Cake Shop. Made with a cream cheese, greek yogurt, and dark chocolate, it is a bit dense but full of moisture at the same time. Think the most flavorful pound cake, but better and more delicate. I always believe that fruit and chocolate go marvelous together, so it was a no brainer to use my raspberries as a topping. I decided to go with a bright, vibrant raspberry glaze. Not only is it radiant and beautiful, it is extra yummy. Since raspberries are not overly sweet, the icing turned out perfect. No food coloring required. Okay, so these are kind of like fancy cupcakes, Bake then in a greased cupcake pan or just peel the papers off before glazing, like I did. 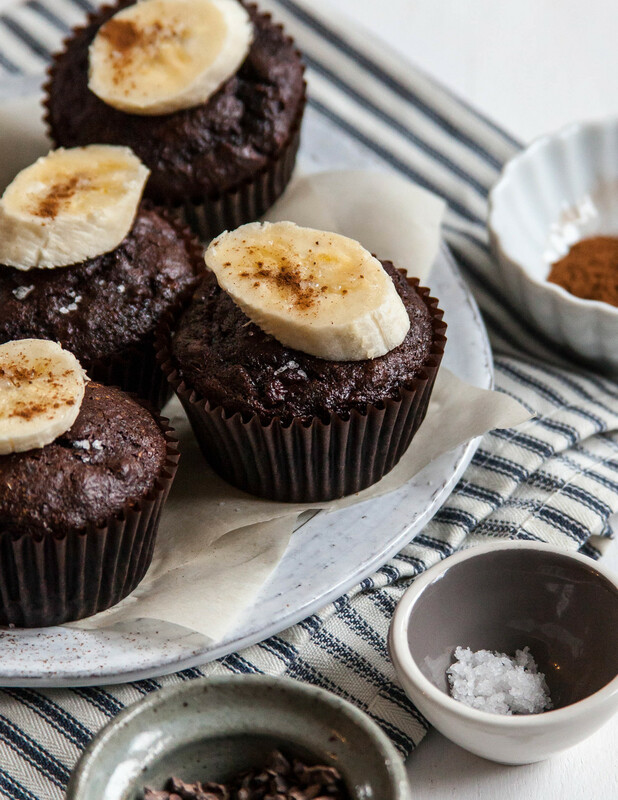 Call 'em muffins, and you can even eat them for breakfast! What flavors are most looking forward to this summer? I can't wait to roast some stone fruits next!! Last week, my little pup turned 3! I don't really know what to say, except the obvious- I love my Remy girl. This stubborn yet sweet little clown of ours has given us so much joy over the past few years. Our bat-eared girl is full of personality and energy, except when she is snoring. She completely embodies the "clown-like" characteristic of a French Bulldog. I never knew what that meant until I met her, but now nothing describes her spins, sprints, and attempts to humor us more. With all the love that she gives, there could not be a more deserving pup of these Pumpkin Banana Dog Cupcakes. Okay, it might be a little obsessive to bake an entire batch of dog cupcakes just for a birthday. But, two things- 1) I forgot her birthday last year (and the year before that, too) and 2) they are pretty much low-sugar, gluten-free muffins. I'd be lying if I said I didn't eat a few myself for breakfast. Made with oat flour, pumpkin, and banana, these treats are perfect for your fur-babies and real babies alike! 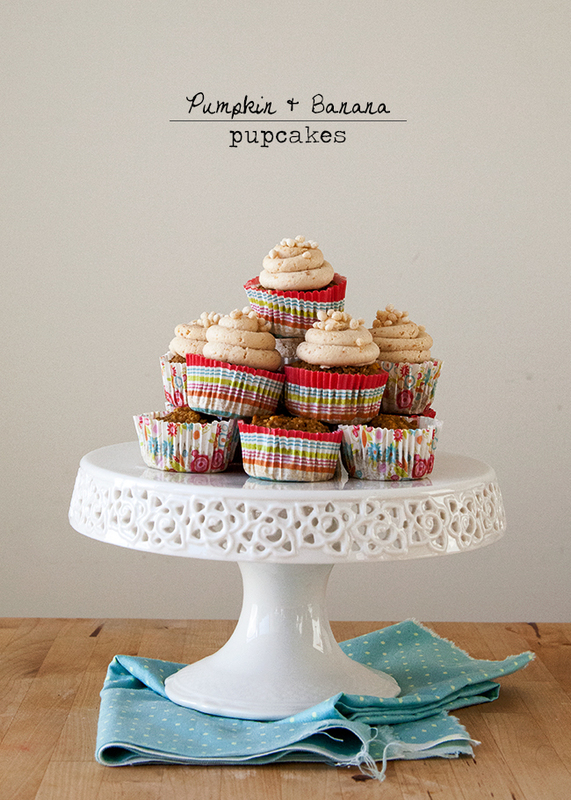 The "pupcakes" are even topped with peanut butter and cream cheese "frosting" and puffed rice cereal "sprinkles." 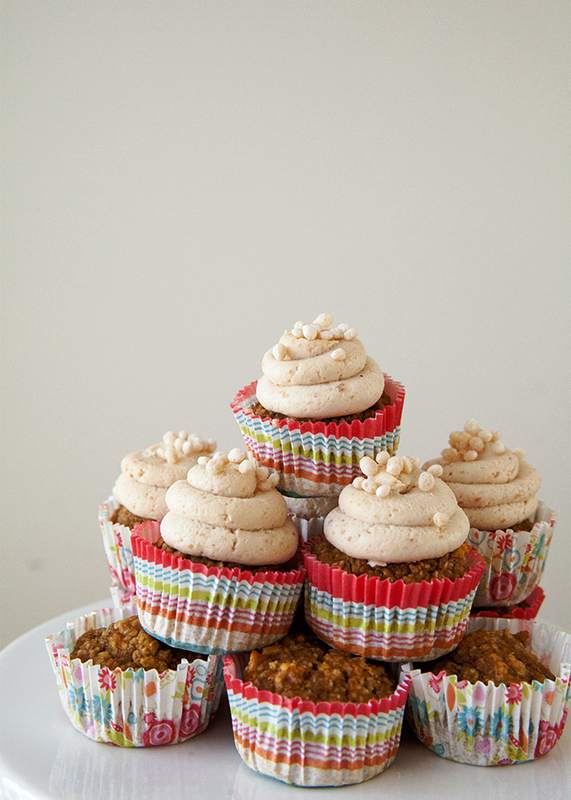 If not for anything else, these birthday treats made for the cutest photo shoot. And guess what her dad gifted her for her birthday? Remy's very own Instagram! Love these pics? Be sure to follow her for more. Preheat oven to 350 degree. Place mini cupcake papers in a mini muffin tin and set aside. Combine the first 8 ingredients until mixed thoroughly. Using a small disher or cookie scoop, place batter in the muffin tin near the top of the papers (batter will not rise much). Bake about 12 minutes, or until toothpick comes out clean when inserted into the center of the cupcake. Cool on a wire rack before frosting. For the frosting, beat softened cream cheese on medium-high until fluffy. Add in the remaining ingredients and mix until combined. NOTE: Honey may not be safe for puppies. Be sure your dog's immune system is mature before giving them honey.